New Bern and the surrounding areas are fortunate to have a regional airport located only minutes from the historic downtown area. Within a 45 minute drive you will find Atlantic Beach, Historic Beaufort, Emerald Isle, Havelock and Cherry Point Marine Air Station, Camp LeJeune, Oriental, sailing capital of the world, Greenville and East Carolina University. Steve and Jana travel quite a bit and can attest to the fact that getting in and out of New Bern is quite easy to do. Retiree's love how easy it is to reach far away destinations with one or two stops. But don't take our word for it. 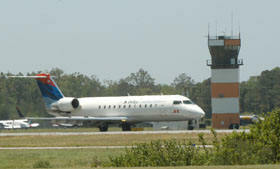 SmarterTravel.com recently selected Coastal Carolina Regional Airport as one of the "Top 10 most stress free airports in the United States." Airport Director said this was especially satisfying because they did not know about the selection process. Someone must have nominated them. US Airway has seven daily direct flights to Douglas International Airport in Charlotte with connecting flights throughout the US. Delta has three daily direct flights to Hartfield International Airport located in Atlanta with connecting flights throughout the world. Need a place to stay while in New Bern?